Stream and record up to four channels of video with the wall-mountable N4WNXL NVR from Speco Technologies at resolutions of up to 6MP. 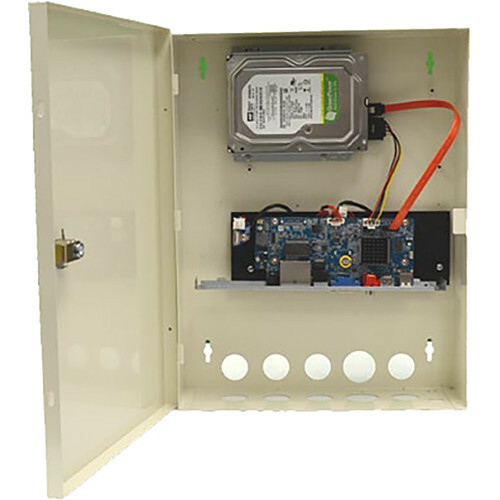 Equipped with one SATA port, this NVR can accommodate up to 6TB of internal storage (3TB preinstalled). The recorder uses H.264 compression to keep file sizes manageable while maintaining recording and playback quality. An integrated PoE+ on switch enables you to power up to four IP cameras directly via their network connection for a clean, clutter-free installation. The recorder's connectivity interface includes two USB 2.0 ports, audio input and output for two-way communication, and HDMI & VGA simultaneous video outputs. ONVIF compliance ensures compatibility with a wide range of surveillance devices. Post Recording 5 Minutes Max.